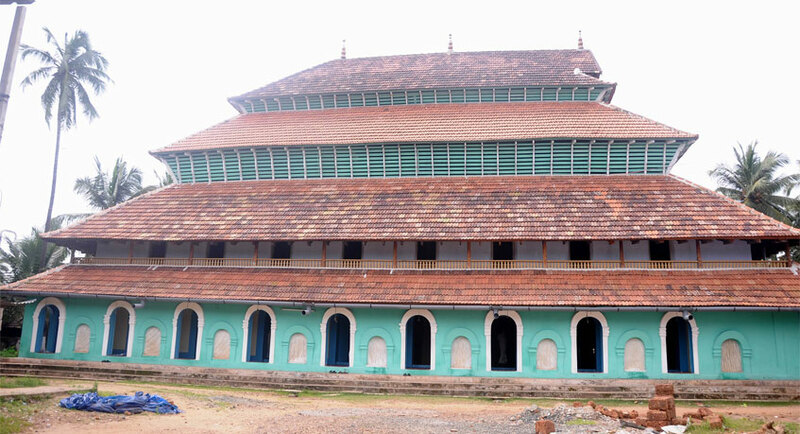 Mishkal Masjid is located in Kuttichira and is the oldest mosque in Calicut. It was built around 700 years ago and is also called as Mithqal palli. It was constructed by an Arab merchant Nakhooda Mishkal and the mosque was named after him. In the year 1510, some portion of this mosque was burnt by the Portuguese. The damage made due to that can be still seen in the top floors of this mosque. Earlier the mosque was 5 storied and it was renovated after the damage and at present it is 4 storied. The architecture of this mosque is very attractive with the 4 storied structures supported by 24 pillars. There are 47 doors that are opened for the devotees and it can accommodate 300 persons in the ground floor. Another feature of this mosque is that there is a square tank near to this mosque seen as similar to the temples in Kerala. The walls of this mosque are made of wood. This mosque stands as an example of communal harmony and people irrespective of caste and religion can enter this mosque. This is one of the important pilgrim centers of the Muslims.